I have not been showing dogs as long as some have, but I have been working with dogs my entire life. I've been blessed with great success so far. I fell in love with the sport over a decade ago and haven't been able to leave it alone since. 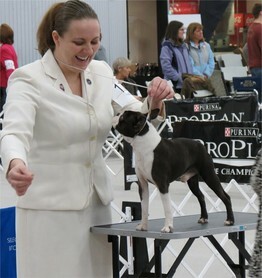 I started with a little Canadian CH Smoothcoat Chihuahua stud, now an American Grand Champion, who thankfully knew what he was doing and played a big part in teaching me the basics of showing dogs. He made me fall in love with this sport. The rest I can attribute largely to the amazing friends I've made in the Crab Orchard Kennel Club here in Southern IL, along with so many wonderful people along the way. I was fortunate enough to be in the company of quality dogs and quality handlers who were willing to help me mold my competitive nature and natural ability with dogs into a presentation I could win with. I am forever grateful to them for all they have given me. From the start I realized I had a passion for handling, and as time goes on it only grows. I was told when I started that I would likely need to hire a professional handler to get major wins on my dogs. Two weeks later my smoothcoat boy was awarded his first major and I haven't looked back from there. I began to tease my friends that it looked like I would just have to become a professional handler. As time went on and I kept winning, a spark of reality touched my dream and started a fire that couldn't be stopped. More time passed, and it became apparent that I have a talent for not only teaching dogs to show, but teaching them to love it. That's where my true passion lies. There are many people who can teach many dogs to show very well. For me, the art lies in bringing the dog to love it. My favorite handlers to watch are the ones whose dogs are having a blast out there. Remember to play with your Dogs! It's beautiful when they're enjoying themselves... you create magic together! We need to see it more. We need to go out and have fun. Let people see the dogs loving it. They will want to see their dog doing it. Show them the happiest dogs they've ever seen. Make them see how lucky and loved show dogs are to get to go show. I think we sometimes forget that part. I haven't been handling since childhood, but I continue to work hard to learn everything I possibly can. I feel as though one never knows everything, and its important to stay open minded and strive to improve throughout your career. With the help of amazing mentors, and beautiful dogs willing to give so much of themselves, I have built a career which I truly love. Its my absolute pleasure to be able to work with these animals and share a bit of time with them. I like to think my happy, upbeat attitude and positive demeanor are a breath of fresh air in the dog show world, and I hope decades from now to be known for being kind, courteous, sincere, and artfully showing some amazing dogs. I have experience with sporting, herding, terrier, non-sporting, working, hound, and toy breeds, and am constantly working to expand my knowledge base. I have references from those whose dogs I have worked with and kept here at my home. I very much enjoy working to get some lovely dogs shown. If you're interested in sending your dog with a handler who puts the dogs first, give me a call. I will dive in whole-heartedly and do my best to present your dog to its fullest potential. I will always be in debt to those who trust me enough to allow me to share time with their dogs, and will never forget those who help make this dream into reality. My most warm and sincere appreciation to all of you who have done so very much to help me get to where I am today. I am blessed with an incredible support system. None of this could have ever happened without you! Thank you for your time and your trust and sharing your knowledge and dogs with me.